The Long-Term Bridge Performance (LTBP) Program began with a pilot study of seven bridges throughout the United States that were selected to serve as representative examples of the most common superstructure types and environmental conditions encountered within the program. The seven pilot bridges are located in California, Florida, Minnesota, New Jersey, New York, Utah, and Virginia. The availability of effective technologies and tools for the desired investigations. The availability of legacy data on the design, construction, condition, and maintenance of the subject bridges. The cost of obtaining, managing, and using the data needed to complete desired studies and reach program objectives. The safety of roadway users during the necessary lane closures. The costs of traffic delays. The coordination necessary with State transportation departments to administer the program in a smooth and efficient manner. Select bridges that fit the program requirements and coordinate with bridge owners to ensure safe and efficient access to the bridge. Minimize the impact of field data collection on the safe and efficient movement of roadway users and minimize the effort required by State transportation department staff to assist with traffic control during data collection. Evaluate inspection, testing, and data collection methods consistent with the accepted test methods published by the American Association of State Highway and Transportation Officials and ASTM International that can be collected in a set of unique protocols designed for use in the LTBP Program. Create effective data management practices to ensure consistent data quality and the seamless transfer of the data to the LTBP Bridge Portal database. Analyze the collected data and experiment with comparing and correlating findings from different data sources to enhance the understanding of the bridge condition and underlying factors that contribute to that condition. The experience gained and the data collected under the pilot phase have helped the LTBP Program researchers understand the following: the speed at which the data should be collected, the minimum necessary duration of traffic interruptions, specialized staffing needs, coordination of field activities for deploying nondestructive evaluation (NDE) technologies, required funds for collecting data from a large number of bridges, consistency in data collection, data interpretation, and validation of the LTBP Program Protocols. (1) Beginning in 2016, the activities and results of the studies of the seven pilot bridges will be presented in a series of reports. 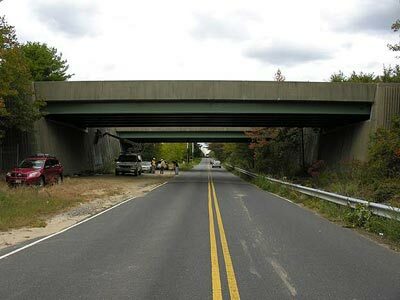 The reports will describe the testing and evaluation methods applied and the data collected at each bridge. The reports will also describe some preliminary analysis of the data and some efforts to compare and correlate findings from different testing methods to enhance the understanding of the data and how it relates to the bridge condition and the underlying factors that contribute to that condition. This summary report focuses on some of the key findings that resulted from the investigation of the deck of the bridge selected for participation in the LTBP Program pilot study located in New Jersey (“New Jersey pilot bridge”). Findings related to the superstructure and substructure of the bridge will be the subject of a future LTBP Program report. Summarized findings from the testing of the other six pilot bridges will be presented in future publications. The New Jersey pilot bridge (see figure 1) carries two lanes of eastbound traffic on Interstate 195 over Sharon Station Road in Upper Freehold, NJ. A parallel twin bridge carries westbound traffic. Average daily traffic volume is approximately 23,000 vehicles, 14 percent of which are trucks. It was constructed and opened to traffic in 1969. The bridge has a multigirder steel superstructure consisting of one span supported on two reinforced concrete abutments and has a cast-in-place reinforced concrete deck with stay-in-place forms. A 6.75-inch-thick reinforced concrete deck with a latex modified concrete (LMC) overlay (nominal thickness of 1.25 inches) distributes live loads to the steel beams. An asphalt overlay was placed in 2010. The weather exposure and environmental conditions in central New Jersey represent a mixed-humid climate, as defined by the U.S. Department of Energy’s climate zones. The bridge is exposed to frequent freeze-thaw cycles and application of deicing agents. Figure 1. Photo. New Jersey pilot bridge. The investigation of the New Jersey pilot bridge included detailed visual inspections performed on the top and underside of the deck, deck overhangs, superstructure, and substructure elements. NDE techniques were used on the deck, and core samples were taken of the deck and piers. In addition to a complete visual evaluation of the concrete deck and the top-of-deck components, a chain drag survey was performed over the entire bridge deck surface during the October 2009 visual inspection (prior to placement of the asphalt overlay). The chain drag survey identified small concentrations of concrete delamination in the northwest, southwest, and southeast corners of the bridge deck. Two locations of longitudinal cracks were observed in the concrete deck where the cold joint of the LMC is present, just north of the lane line. It was not possible to visually re‑inspect the deck in 2011 or to repeat the chain drag. An array of NDE technologies—including ground penetrating radar (GPR), pachometer (magnetic field) testing to determine cover depth, impact echo (IE), ultrasonic surface wave, half-cell potential (HCP), electrical continuity of reinforcing steel, electrical resistivity (ER) methods, and a proprietary moisture sensor system—were used to evaluate different characteristics of the deck concrete and reinforcement, including corrosion potentials and corrosion current density (corrosion rate). Two rounds of investigation of the deck were conducted, in October 2009 and August/September 2011. Because of the presence of the asphalt overlay in 2011, it was not possible to visually inspect the top deck surface or conduct IE testing, and GPR signals were affected. These differences made estimating condition changes that occurred over the almost 2-year period more difficult. During each round of testing, in 2009 and 2011, the deck was tested using GPR (see figure 2). Figure 2. Photo. 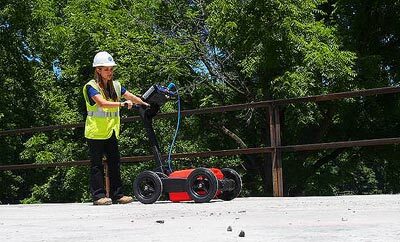 GPR with a ground-coupled antenna. After each round of testing, concrete cover depth maps (depth to the top layer of reinforcement) (see figure 3) and depth-corrected maps of the deck condition (see figure 4) were produced from the GPR testing. Figure 3. Contour maps. 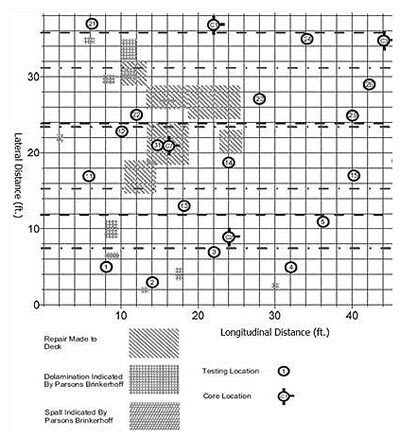 Rebar depth estimated using GPR from the 2009 (left) and 2011 (right) surveys. Figure 4. Contour maps. 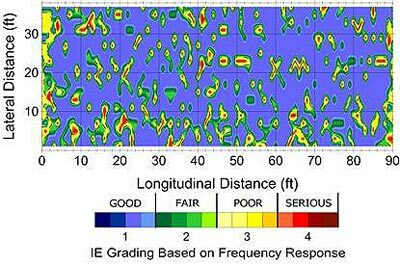 Depth-corrected GPR attenuation-based grading from the 2009 (left) and 2011 (right) surveys. There are significant differences between the depth-corrected GPR condition maps generated in 2009 and 2011. These differences are likely the result of some combination of deterioration of the concrete and the effect of the asphalt overlay on the GPR signals. The amount of attenuation attributable to the overlay depends on the overlay’s thickness and homogeneity. Even though asphalt is not a medium that can significantly scatter or attenuate a GPR signal (especially when it is new, thin, and of uniform thickness), the differences attributable to concrete degradation between 2009 and 2011 cannot be determined with confidence. The 2011 condition map of the overlaid deck will serve as the baseline for future comparisons. 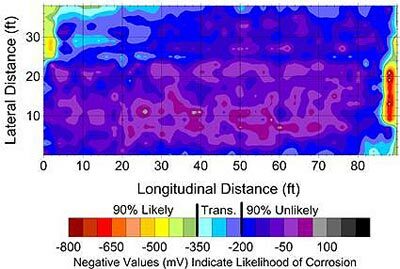 Additional research would be necessary to attempt to quantify the attenuation loss through the existing overlay more precisely and shed some light on the potential sources of attenuation. The condition map from the 2009 IE assessment (see figure 5) indicates there is some significant delamination, with roughly 10 percent of the deck in serious condition and an additional 33percent in fair to poor stages of delamination. Depths to the delaminated surfaces were not estimated. More than half the deck area displays no evidence of delamination. No significantly large delaminated areas were detected, and delaminations were distributed randomly throughout the deck surface. As noted during the 2009 investigation, only scattered delaminations were detected during the sounding using a chain drag. IE testing was not repeated in 2011 because of the presence of the asphalt overlay, which precludes any possibility of comparing IE results over multiple testing cycles. Figure 5. Contour map. IE condition map from the 2009 survey. One goal of the pilot phase was to analyze the collected data and experiment with comparing and correlating findings from different data sources to enhance the understanding of the bridge condition and the underlying factors that contribute to that condition. However, in some cases, these comparisons may result in noticeable lack of correlation and ultimately raise additional questions. An example is comparing the findings generated by sounding the concrete deck with chain drag and hammer with the data from IE. The IE results in figure 5 show randomly scattered areas where delamination is likely, but the results of the soundings (see figure 6) show rather concentrated areas of suspected delaminations that do not correlate well with the IE indications. Figure 6. Sketch. Testing locations of first half of deck. The differences in the indications of delamination provided by these two methods would need to be examined by coring. Alternatively, if the asphalt overlay were not present, a comparison of data from future cycles of testing might show better correlation. Based on ER (see figure 7) and HCP (see figure 8) condition maps, less than 5 percent of the deck area falls within the range where there is a strong likelihood that active corrosion is occurring in the deck steel. HCP measurements showed that these areas were mainly along one of the bridge joints. ER testing also showed corrosion activity along the bridge joints and along one gutter, with less than 5 percent of the deck area falling within a range of 0 to 35 k Ω-cm. 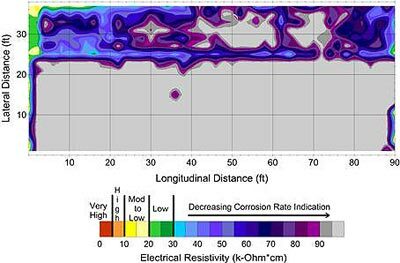 Over 75 percent of the deck yielded ER measurements exceeding 90 k Ω-cm, indicating that the electrical conductivity of the concrete environment would likely not support corrosion at the time of testing. This indicates that at the time of testing, corrosion activity was low. However, a few notable corrosion hot spots were evident, mainly near the abutment joint lines. Figure 7. Contour map. ER condition map from the 2009 survey. Figure 8. Contour map. HCP condition map from the 2009 survey. In figure 7, there is a distinct border between areas where ER results indicate conditions that support corrosion, and in figure 8, there is a similarly located border where HCP results indicate the likelihood of corrosion. The reason for this demarcation was uncertain. However, one possible cause might be related to the placement of the LMC overlay. When the overlay was placed circa 1997, the dividing line between the two stages of placement (see figure 9) was at the same location where the border appears on the plots in figure 7 and figure 8. Differences in the LMC mix and/or placement practices may be the cause of the differences in corrosion activity. Figure 9. Sketch. Cross-section of the deck showing the location of the LMC overlay circa 1997. In addition to the NDE testing, material sampling of the concrete in the bridge deck was performed once in 2009 prior to the placement of the asphalt overlay on the deck. The sampling regimen included collecting powdered concrete samples at consecutive 0.5-inch depths and cutting concrete cores, usually without embedded reinforcement. A total of 32 random locations were selected (30 in areas of sound concrete and 2 in areas where delaminations were detected using the chain drag) to provide a statistical sample for analysis of corrosion-related data. A total of eight core locations were selected for laboratory testing of concrete properties. One 4-inch-diameter core was taken at each location. Chloride content and chloride diffusion coefficient. Compressive strength and static and dynamic moduli of elasticity. Concrete density–related characteristics, including ultrasonic pulse velocity, bulk density, pore volume, and percent saturation. A four-point Wenner resistivity test, a two-point resistivity test, and a rapid chloride permeability test in accordance with ASTM C1202. (2) These tests were conducted on selected cores prior to destructive physical testing or bulk drying/moisture testing that would alter the conductive state of the materials. Petrographic analyses of deck and substructure (piers) cores to determine the pH, concrete bulk density, concrete pore volume, concrete percent saturation, and alkali-silica reactivity and to evaluate the cement paste and coarse and fine aggregates. Determining the chloride content of the deck concrete is one of the most reliable ways to assess the condition of the concrete with respect to the chloride-induced corrosion. Results included chloride concentrations at the surface and reinforcement bar depth, chloride diffusion coefficients, and strength and modulus values for both the base concrete and the LMC overlay. Table 1 presents a summary of the surface chloride content and chloride content at the topmost reinforcement bar depth. The chloride content at both the surface and at the bar depth were shown to be normally distributed. This is illustrated quantitatively because the computed mean and median were approximately equal. However, the coefficients of variation show that the chloride at the bar depth (58 percent) is more variable than the chloride measured at the surface (22 percent). Table 1. Summary of New Jersey pilot bridge deck surface chloride and chloride at bar depth. Based on core depth measurements, the LMC overlay has a maximum thickness of 1.6 to 1.75inches. Therefore, the chloride average depth measurements of 0.5, 1.0, and 1.5 inches were representative of the LMC overlay concrete, whereas the remaining average depth measurements of 2.0, 2.5, 3.0, and 3.5 inches represent the base concrete. The presence of the LMC overlay complicates the calculation of the chloride diffusion constant using Fick’s Second Law. Table 2 presents the distribution of chloride diffusion coefficients using all eight chloride contents (three in the LMC and five in the base concrete). Table 2. Summary of New Jersey pilot bridge deck chloride diffusion coefficients. The compressive strength, dynamic modulus, and static modulus are shown in table 3. The strength parameters (compressive strength and modulus of elasticity) were obtained from cores C1, C4, C5, and C8. The bulk concrete properties (density and moisture content) were obtained from cores C2, C3, C6, and C7-B. When preparing cores for laboratory testing, 2-inch strain gages were mounted on the base concrete, and 0.5-inch gages were mounted on the LMC overlay concrete. The base concrete strain gage length was about 2.5 times greater than the base concrete maximum aggregate size and was centered within the general height of 4 inches. The gage length for the LMC overlay concrete was about equal to the maximum aggregate size and was centered within the general LMC overlay height of 1.75 inches. Table 3. New Jersey pilot bridge deck concrete LMC overlay/base composite compressive strengths and dynamic moduli and the base static moduli. The highest and lowest composite concrete strength values exhibited a 10-percent variation from the average (6,200 psi). The average static modulus value of the base was 4.6 million psi; the LMC overlay average static modulus value is 5.9 million psi. The difference between the highest and lowest static modulus values for the base was 0.38 million psi, whereas the difference between high and low LMC overlay values was 1.35 million psi. It appears that the compressive strength of the base concrete is the dominant contributor to overall compressive strength results for the core with overlay. The investigation of the New Jersey pilot bridge was part of a planned study of seven pilot bridges that differed in age, type, condition, environment, and traffic volumes. The field testing and the subsequent analysis of the data collected helped present an in-depth picture of the condition of the bridge deck. The deck, in particular, was determined to have some early indications of corrosion activity and the expected resulting delaminations. Experience was gained in field research activities, including maintenance of traffic, implementation of a variety of evaluation and testing methods, and processes for data analysis and comparison of findings. Some comparisons of data provided consistent conclusions such as the complementary findings of the ER and HCP testing. Combining the legacy data for previous rehabilitation work with the ER and HCP findings identified a possible reason for distinct condition on two different parts of the deck. Other comparisons, such as visual delaminations with IE findings, were not consistent. The experience and findings from the New Jersey pilot bridge will be combined with those from the other pilot bridges to streamline field activities, strengthen testing protocols, and plan for investigations of large numbers of bridges in the future. Hooks, J.M., Rodriguez, Y., and Weidner, J., Long-Term Bridge Performance (LTBP) Protocols, Version 1, Report No. FHWA-HRT-16-007, Federal Highway Administration, Washington, DC, 2016. ASTM C1202-12, Standard Test Method for Electrical Indication of Concrete’s Ability to Resist Chloride Ion Penetration, ASTM International, West Conshohocken, PA, 2012. Researcher—This study was performed by Rutgers, The State University of New Jersey, The Center for Advanced Infrastructure and Transportation, 100 Brett Road, Piscataway, NJ 08854-8058, Contract No. DTFH61-08-C-00005. Availability—The publication associated with this summary report is the forthcoming New Jersey LTBP Pilot Bridge: Preliminary Field Test Results. Key Words— LTBP Program, LTBP pilot bridge, New Jersey pilot bridge, bridge performance, bridge testing, bridge inspection.